Team Sky will be followed by a bespoke Jaguar F-Type Coupe during the opening prologue of this year’s Paris-Nice on Sunday. Specifically, the Team Sky car will feature the iconic rainbow stripes down the bonnet, and it will trail no other than Bradley Wiggins along the 6.7 kilometer route in Maurepas. Sunday will mark the second time that Wiggins has donned the world champion’s kit, since finishing third in the trial event during last month’s Tour of Qatar. Wiggins says, Paris-Nice will give riders the opportunity to show their form ahead of the Classics season. “We’ve got a strong team riding in Paris-Nice”, he said. “It’s the first major stage race of the European season, so there’s traditionally some added intensity amongst the teams to set their stall out ahead of the classics. 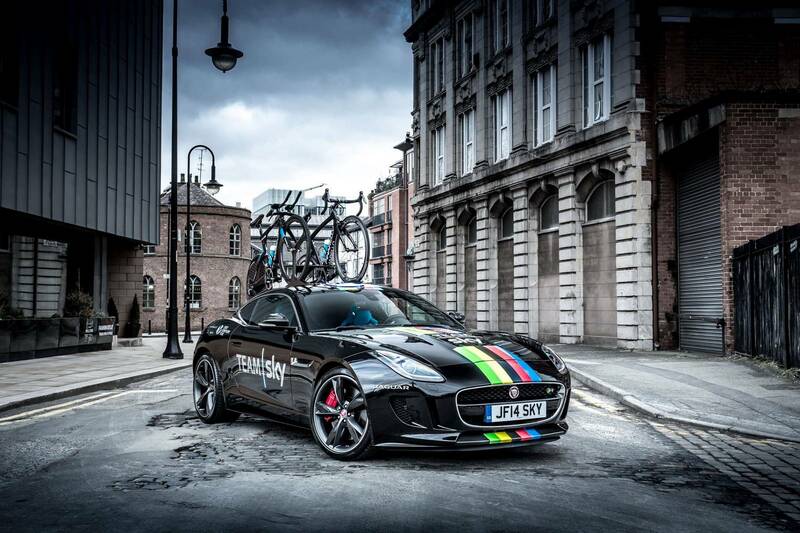 Jaguar Land Rover’s global brand director, Mark Cameron, added “Sir Bradley Wiggins has been integral to the success of Team Sky and activation of our partnership. “We felt it important to celebrate his status as world time trial champion in our own unique way.